Over 100 storeys, it boasts the world’s highest swimming pool and perhaps as expiation also the world’s highest mosque. Its golf course requires over four million gallons of water a day. Last week, amid much fanfare, the legendary tower finally threw open its majestic doors to the public. Previously known as Burj Dubai the structure was renamed Burj Khalifa in honour of the Abu Dhabi ruler and UAE president who had bailed out struggling Dubai with a sum of billions of dollars. Envisioned and designed by a Chicago firm, the Burj is said to have been inspired by the vision of architect Frank Lloyd Wright’s Sky City which was to be built in Chicago. However, it was never realised as it lacked both the funds and labour. Neither of these were seemingly a problem in the construction of the Burj which employed thousands of labourers from Pakistan, India and Bangladesh for several years for its construction. According to reports, the vast majority of these workers have never even been to the top of the building they spent years constructing. 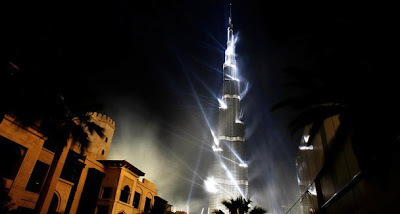 But not seeing the view from the top is hardly the biggest problem faced by those who constructed the Burj; there are allegations that many have died in the construction of the Burj. Such construction projects take a huge toll. Records kept by the Indian mission for only one year showed that nearly 1,000 Indian workers had died, more than 60 in accidents on the site. The Pakistani and Bangladeshi missions do not keep records of the many labourers who have died possibly deterred by the criticism of the UAE authorities. Based on estimates the total number of workers killed in such construction projects is believed to be well into the thousands.